Dorothy Day, co-founder with Peter Maurin of the Catholic Worker movement, devoted her life to serving the homeless of New York City. She was a tireless advocate for peace and justice in both word and deed. She founded and edited the newspaper The Catholic Worker, which is still published today. "I firmly believe that our salvation depends on the poor." Recognized as a monumental peace and justice activist in Cuba, Italy, Africa, the U.S.S.R., and the U.S., American journalist and activist Dorothy Day was rejected for the Nobel Peace Prize as "too radical." The Nobel committee was not wrong. Day’s belief in "the primacy of the spiritual" in social change, and her desire "to associate [herself] with ... the masses in loving and praising God" (Day) led her to found the Catholic Worker Movement – truly a radical fusion of activism and faith. Day was born November 8, 1897 to John and Grace Satterlee Day, in Brooklyn, New York. Frequent family relocation due to John’s profession as a sportswriter combined with the elder Days’ non-religious beliefs and Mr. Day’s strict rules regarding friendships to instill in young Dorothy a profound sense of loneliness, as well as an avid interest in religion, reading and writing. After growing up in New York and California, Dorothy attended high school in Chicago, and in 1914 received a scholarship to Illinois’ Urbana College. After studying writers like Tolstoy, Sinclair, and Kropotkin – who heightened her passion for social justice – in 1916 the young Day left college and moved with her family back to New York. Between 1917 and 1921, Dorothy Day took up work as a journalist with the Marxist papers The Call, The Masses, and The Liberator, covering issues including rent strikes, and the birth-control and peace movements. Rejecting Christianity at this time of her life because of its "hypocrisy," she joined the International Workers of the World and participated in Greenwich Village intellectual circles. After being arrested for pacifist and suffragette protests in 1918, Day felt a need to identify herself with poor people more directly, and trained as a probationary nurse in Brooklyn. At the same time, a love affair with newspaperman Lionel Moise ended in an abortion, followed by a brief and unhappy marriage to Barkeley Tober, a New York literary promoter. Dorothy paused her activism to travel in Europe between 1920 and 1924, publishing The Eleventh Virgin, an autobiographical novel addressing the conflict between social action and personal life affecting many female radicals. Upon returning to Staten Island, NY, she entered into a common-law marriage with biologist and anarchist Forster Batterham, and in 1927 gave birth to their daughter, Tamar Teresa Hennessy. When Dorothy became strongly drawn to the Catholic church and had herself and Tamar baptized, Forster joined most of her atheist friends in alienating her completely. After a short time as scriptwriter for a Hollywood studio, and severe turmoil about the break with her friends and partner, Day began to reconcile her Christian faith and communist beliefs by writing for the Catholic journal Commonweal. In December, 1932 she furthered this reconciliation by founding the Catholic Worker Movement with priest and fellow social activist Peter Maurin. The Movement embodied Day’s concept of "personalism" – an ideology pointed toward the transformation of individuals rather than political and economic relationships. After publishing the first few issues of the Movement’s newspaper The Catholic Worker (against Maurin’s advice), Day insisted that the Worker could not advocate economic justice without working to bring it about. So in 1934 she and Maurin founded St. Joseph’s House of Hospitality, a refuge for people suffering in the Depression. By 1940 the newspaper had reached its peak circulation of 185,000 and Hospitality House had expanded to a network of thirty hospices and work farms, remembered in Day’s book House of Hospitality (1939). After Peter Maurin’s death in 1949, Day continued to head the Catholic Worker Movement, successfully steering it through the 1970s (by 1980 there were seventy worker hospices). During those years, she also travelled the world extensively and published several books, including her autobiography (The Long Loneliness, 1952) and two collections (1948, 1972) of her Catholic Worker column "On Pilgrimage". In 1980 at New York’s Maryhouse hospice, Day died as she had lived – working with ordinary poor folk for social change. Throughout her life, Day unabashedly and consistently spoke out, condemning fascism, nuclear weapons, and the Vietnam War, and supporting WWII draft resistance, an undertakers’ strike against the New York Catholic archdiocese, and the United Farm Workers’ unionization of migrant workers. 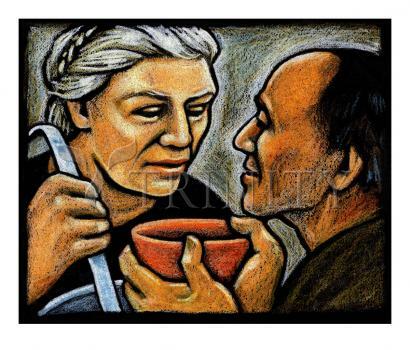 Day’s balance of radical social beliefs and conservative doctrinal views enabled her to avoid being censured by the Church, and thus to raise awareness among Catholics and all people of struggles for social justice.